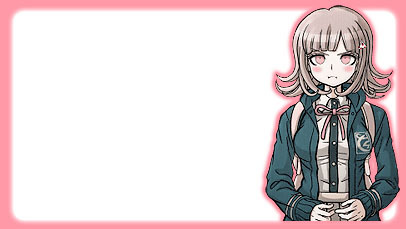 You reached Seraphic, the fanlisting dedicated to Nanami Chiaki, one of the main characters of the series Super Dangan Ronpa 2: Sayonara Zetsubou Gakuen. Feel free to look around and don't hesitate to join the fanlisting, if you're a fan! *--* And pay attention to the spoilers that you will find everywhere~! Super Dangan Ronpa 2: Sayonara Zetsubou Gakuen is property of Spike/Spike Chunsoft. Layout and contents are ©Miriallia do not steal, claim for yours or reproduce, please.